Anyone know of one that will work in place of the stocker that kicks the fan on sooner? Maybe a 95°C/115°C? Seeing how mine doesn't work, why not upgrade? There's a few different ones you can use. The first number in parenthesis is the temperature that the aux fan engages at high speed, and the second number is when the AC compresor will cut out. Ohhhh so there's no low speed for the aux fan when it kicks on? I'm not too worried about when the comp kicks off as I'd have the A/C off and the heat on high by then, so maybe the red is best? The temp switch on the head that is referred above will start the fan on high speed. The temp. switch on the dryer will start the fan at low speed. What would be causing my aux fan to run constantly? Could that be a switch problem also? 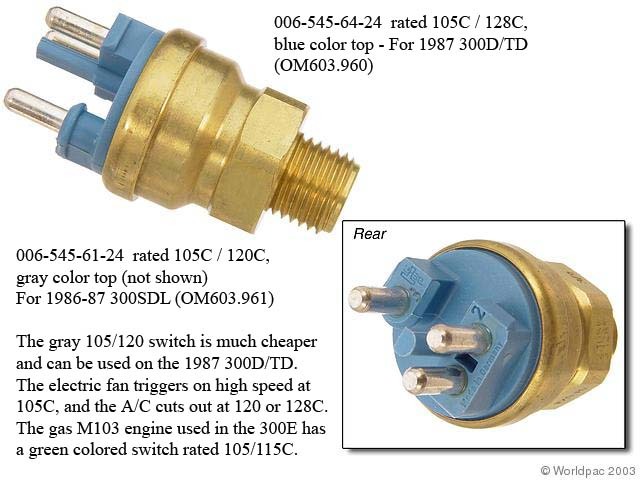 Just ordered from Phil 5 minutes ago, I decided on the green because I want the AC compressor to be killed before it gets to 120C. My 420 does that, I haven't even gotten that far with it yet... BUT I would assume that's the problem. Until then I just unplugged the fan. The AC compressor should be killed when it passes 105°C. Which is the aux fan temp sensor? I have two sensors on the water outlet connecting to the upper radiator hose. One sensor (single pole) is for the instrument cluster temp gauge. The second sensor (two pole - blue) is next to the first which I thought may control the aux fans. I also have a sensor (lt. green) in the head behind the IP. Which controls the aux fans? I like the idea of 95°C/105°C, but I guess 95°C/115°C would be better than stock. Any idea what the part number is? while you are in there and if you want more control, set up a manual override switch on your aux fan so it is there on demand. I replaced my mechnical fan with twin electric units and have them independedntly wired, fused, and thermostatically controlled as well as indi override switched. In addition I also added a two way hi/lo manual override switch for the aux fan. Now when I need that extra AC boost at Idle, I can switch on the aux fan hi/lo as needed...also useful in a emergency situation when your coolant temp rises or one of your switch fails, manually throw on the fans full blast! My gang of switches is now fully occupied on the dash, used standard MB switches of the correct style. I'm having a hard time getting her to hit one button to switch vo on and off!